20 Minute Ground Beef Tacos | Bake. Eat. Repeat. A quick and easy weeknight meal, only 20 minutes to have these fantastic ground beef tacos on the table! Plus, the prepared taco meat freezes beautifully! Is there anything better then ground beef tacos that are on the table in 20 minutes? Probably not. I know it’s definitely one of our favourites – one of those meals that we make very, very regularly. And will never tire of. 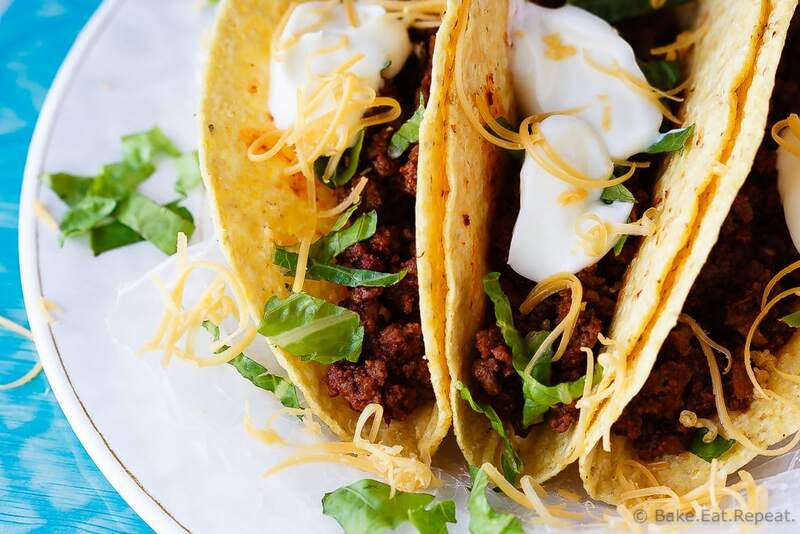 I love these ground beef tacos because they’re so fast and easy to make, but also because you can make a giant batch of the meat and freeze it in portions so an even faster meal is waiting for you in the freezer. When all you have to do is defrost your ready made taco meat and chop up the toppings, supper is literally minutes away. This meat is pretty versatile too – we’ve used it in hard ground beef tacos as shown here, but also in soft tacos, taco salad and nachos. It’s taco meat – it’s fantastic no matter how you serve it! So, since it’s 30 Minute Thursday, and Cinco de Mayo today, I really needed to share our favourite ground beef tacos with you. I’ve been making this recipe for years and absolutely love it. 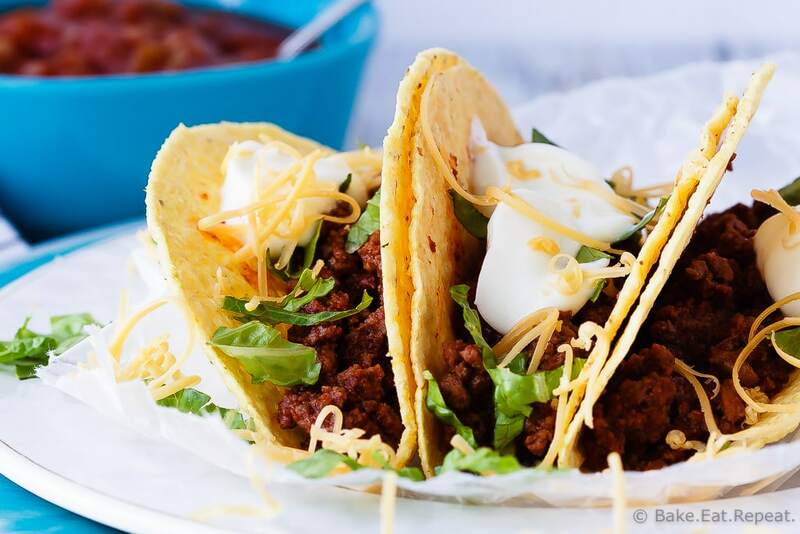 Fast, easy, simple, and full of flavour – we love this taco meat and I’m sure you will too! Don’t forget to scroll down to below the recipe for a list of more 30 minute meals from my blogging friends. You can also find previous 30 Minute Thursday posts here with plenty more 30 minute meal inspiration to help with those busy evenings. In a large skillet, heat the oil over medium heat. Add the chopped onion and saute for 1-2 minutes until softened. Add the ground beef and cook, breaking it up and stirring until it is cooked through, about 5-6 minutes, and then drain the grease. Stir in the garlic, jalapeno pepper (if using), chili powder, cumin, coriander, salt and pepper and cook for another 30 seconds. Add the tomato sauce, lower the heat and simmer for 10 minutes. Serve with whatever taco fixings your family likes! I typically don’t add the jalapeno pepper to my taco meat as my kids find it too spicy, but I prefer it with the added heat. Without the seeds it really doesn’t make it too spicy - unless your family dislikes spicy food as much as my kids do! The prepared taco meat also freezes very well if you want to double or triple the recipe and then freeze it in smaller portions in ziplock bags. Source: Adapted from Mel's Kitchen Cafe . This is similar to my ground beef taco recipe but I love that you added the jalapeno for some kick! These look like they need to be on the menu for next week's taco tuesday! These tacos are totally up my alley!! 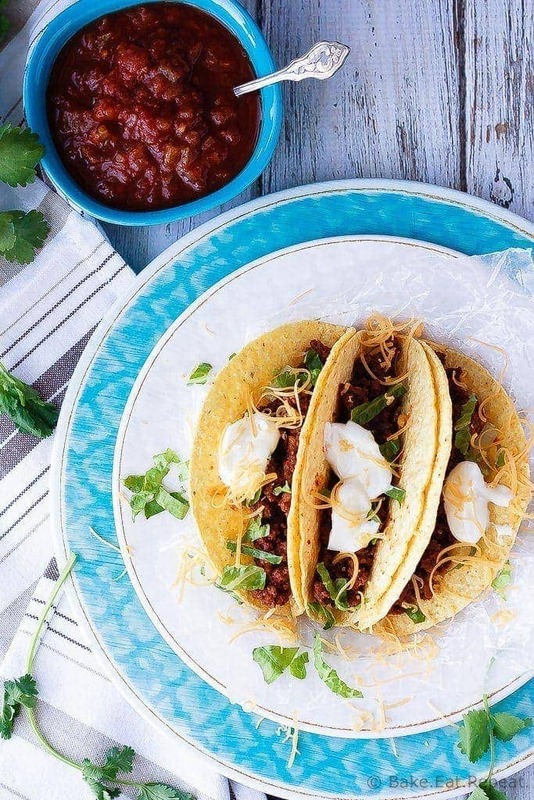 I'm always down for taco night and I love how quickly these can be thrown together!! These tacos are making me hungry! I love meals that come together as quickly and easily as these. And it's even better when you can make a big batch and freeze some for later! I definitely love how fast and easy tacos are! They are one of my go-to meals for busy weeknights. These ones look delish-- and I love the idea of making extra meat to freeze! I'm wishing I had some of these tacos for dinner right now instead of Chinese food. :) I love how quick and easy these tacos are. Perfect for soccer busy nights!! My mom would always make tacos like this using the seasoning packets growing up, but since I've started making it myself I just spice them myself too! I need to try out your recipe :) ground beef tacos are some of my faves - love how easy they are! Love how quick this recipe comes together. Tacos are always a favorite! Happy Cinco de Mayo! Oh this sounds so good to me right now. I haven't had lunch yet and I'm just drooling over all the lovely 30 minute creations this week! Happy Cinco de Mayo! I'm so bad, I always use taco seasoning...this looks like a much better option! Love that you can freeze it, I've never thought to do that before. We definitely do not have tacos often enough! They are so fun and SO delicious, but I never think to make them! I will definitely have to try this version! I love making tacos because they're always a hit and they're so quick! These look delicious, Stacey, and I love that they're on the table in 20 minutes! Ground beef tacos are pretty much a staple in my house. I just love how versatile they are, and it's so fun to add different toppings and spices! These look just perfect, Stacey! I think I would devour these all in no time!